Rockwell Universalist is an absolute jewel of a rural church organized in 1839, in what was known as the Mulberry community in Jackson County (now Barrow). The earliest history states “considering the character and free thinking minds of those people, that the seeds of Universalism and liberal thought sown by itinerant preachers, should appeal to them and which later resulted in the organization of the church”. The historical marker at the site states that Rockwell is the second oldest Universalist church in Georgia. The church struggled in the earliest years, and especially so during the Civil War, but was “re-organized” in 1867 by a Doctor Andrews and has prospered ever since. 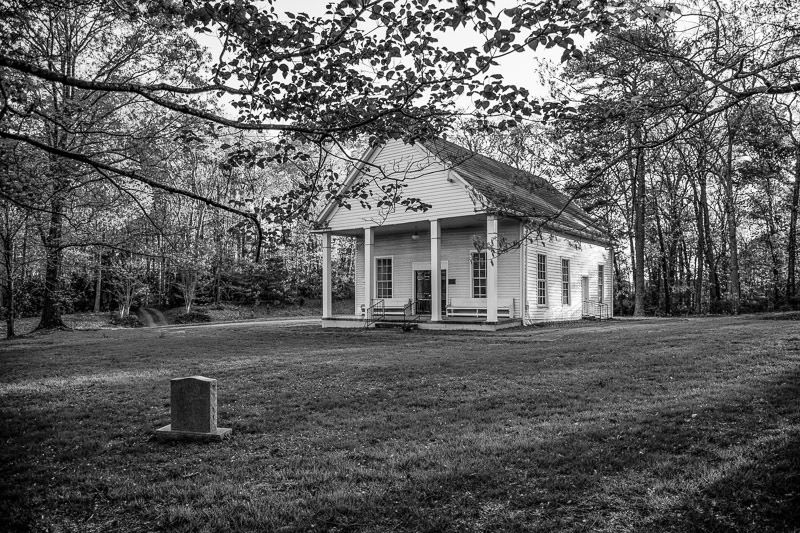 The church first met in a brush arbor and later in the local school located across the road in the first floor of a two story building – the second floor being used for a Masonic Hall. The church that you see above was erected in 1881 using volunteer labor and donated materials from the community. In the earliest years, the church was named the First Universalist Church of Jackson County but was renamed Mulberry Church when the new sanctuary was dedicated in 1881. In the 1920’s, the church was then renamed Rockwell, in recognition of the Rockwell School and Masonic Hall where its members worshiped for so many years. The school and Masonic lodge had also been a recruiting and training ground for soldiers during the Civil War, as well a Justice Court and a voting precinct known as House’s District. One of the founding members of the church was John G. House, the local Justice of the Peace and school master…..a forward-thinking man who loved justice and practiced mercy toward his fellow man. John, and his wife Harriet, had four sons and three daughters. All four sons served in the war and two of them paid the ultimate price. The House (also spelled Howse) family roots are very deep in this part of what was then Jackson County………we will visit their family cemetery in later photographs. Many Universalist state conventions were held at Rockwell and, according to the history, prior to one of these in 1895 the church was finished inside with a ceiling and interior features of lumber donated by one of the members. The historical character of the church has been well maintained over the years, even as development and highways have encroached. We are fortunate that the loving stewardship of the congregants has maintained this old treasure for present and future generations. The sanctuary of Rockwell Universalist has been modified and improved many times since the construction date of this building in 1881. Still, the interior design, layout and decorative elements remain true and authentic. Today it still presents as a cozy, attractive, 19th century rural church. 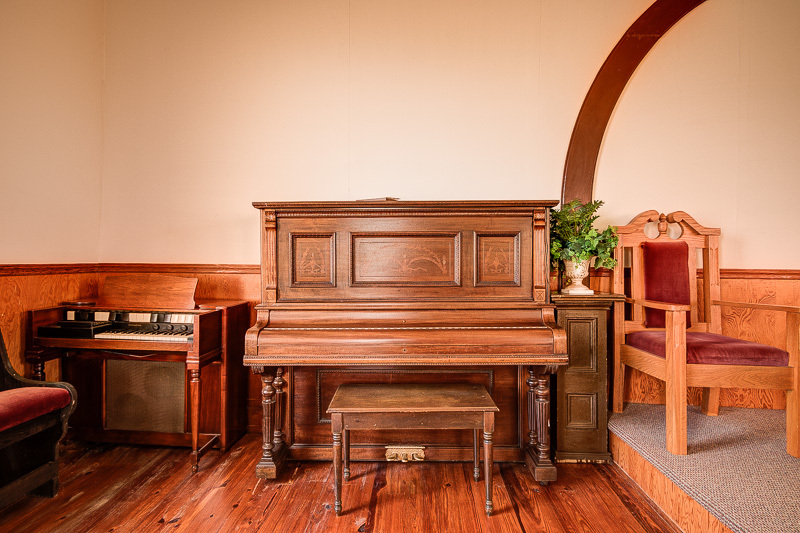 And, the creature comforts incorporated into its design throughout the 20th century are what helps this church continue to remain active and attract congregants into the 21st century. This view from the pulpit allows us to experience the inviting atmosphere within Rockewell. Tall, six by six, double hung, frosted glass pane windows allow the interior to be flooded with natural light. The sanctuary’s compact design brings the congregation closely together and right up to the chancel. There is not a bad seat in the house. The interior walls, wainscot and ceiling along with the other interior elements have been well maintained over the years and the congregation’s loving stewardship of their sanctuary is evident. 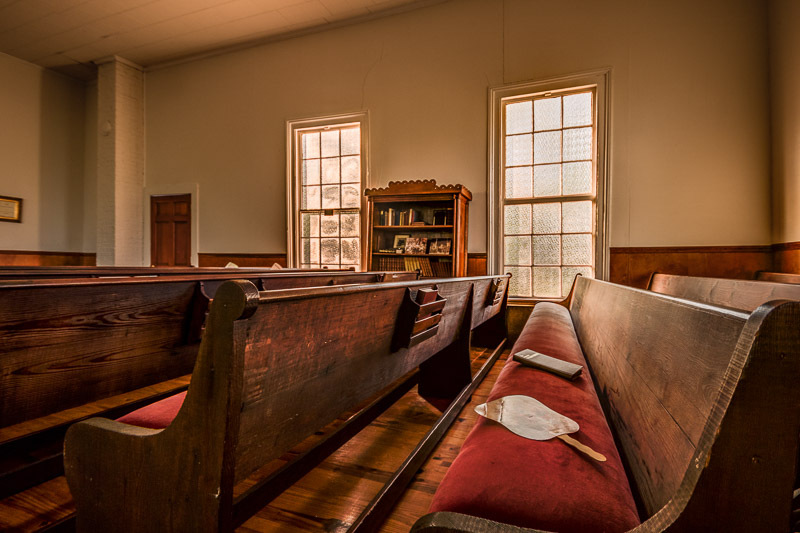 According to church records, the original, primitive pews were replaced around 1905 or 1906. 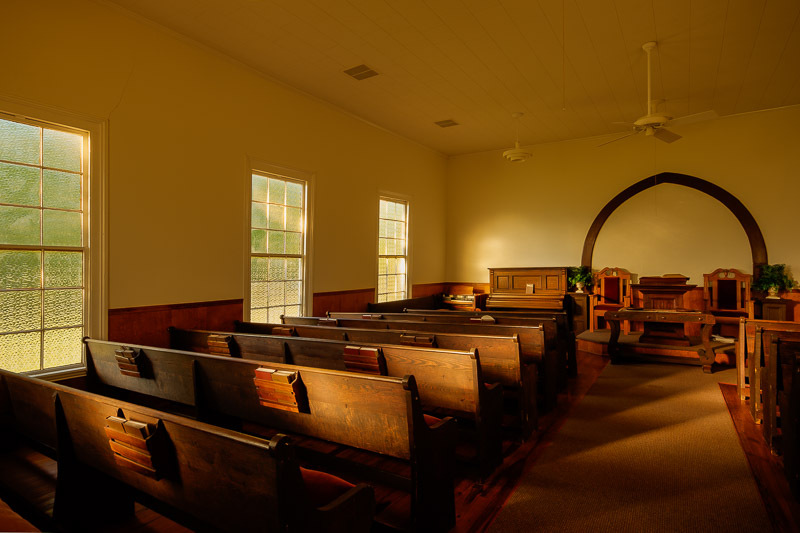 These pews were hand made by,” John, Henry and Bob Hill as a labor of love for their church.” Congregational support such as this at every level provides further tangible evidence of the importance of these rural churches and the fact that they provided the social and communal “glue” to make these settlements function as well as they did. The pine floors you see below had to be replaced in the mid 20th century. It was also decided to wall off the portion of the church behind the present chancel, pulpit and choir area in order to provide class rooms. These changes were made to accommodate a growing and thriving congregation. At the same time, the ambiance and authenticity of the sanctuary was maintained. The House family was one of the pioneer settlers in this part of Georgia. The records are confusing however, since the family name is spelled in multiple ways i.e. House – Howse- Howze. 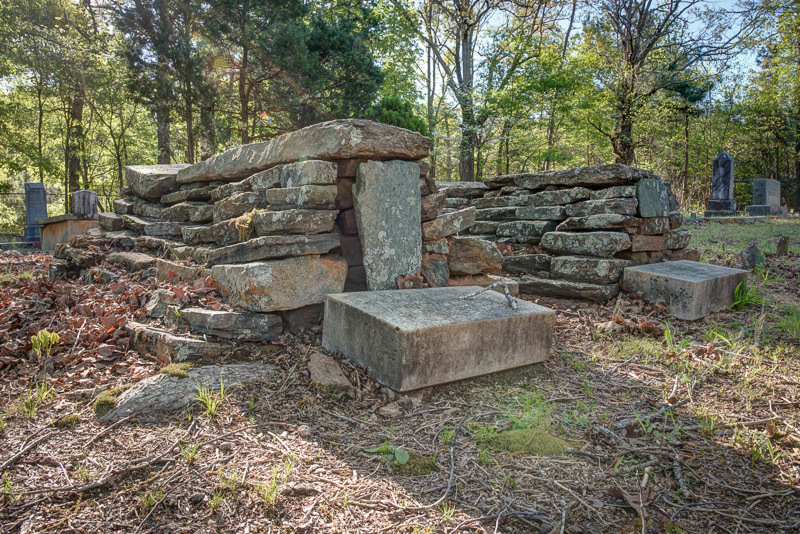 The two stacked stone graves are that of Mary J. Howse, an infant who died in June of 1848, and James L. Howse, who died Feb of 1837. At the foot of each is a marble marker in tribute to John G.’s two sons, William and Henry, who died of disease during the war in Richmond, both in August of 1862. 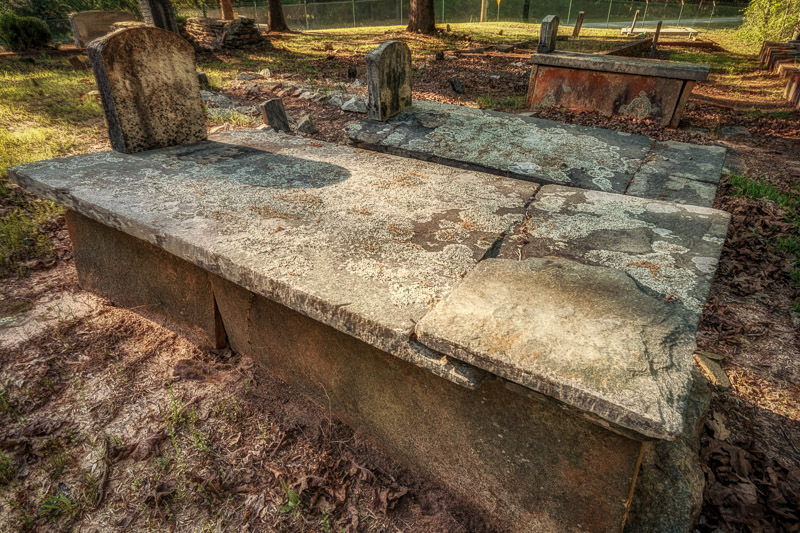 In the foreground is the grave of John G. Howze (Howse), the patriarch of the family (1805 – 1862) and one of the original founders of Rockwell Universalist church. According to Find a Grave he died in August of 1862 but there is some additional controversy since records show he applied for son Henry’s unpaid Confederate wages in December of 1862. Something is amiss with the dates, but from what we see, the father and both boys died in August of 1862. The grave beside him is his wife Margaret (1813 – 1869) and the third grave is that of Missourie Howze (1856 – 1876). We are not sure of her relationship to John. The graves show spellings of the family name as Howse and Howze yet the cemetery sign give it the official name of House. Pretty confusing but the cemetery is well cared for and a fitting tribute to one of Georgia’s early pioneer families. Maybe someone out there can shed some light on it. Note – someone has. It would appear that August 22, 1863 is the correct date. 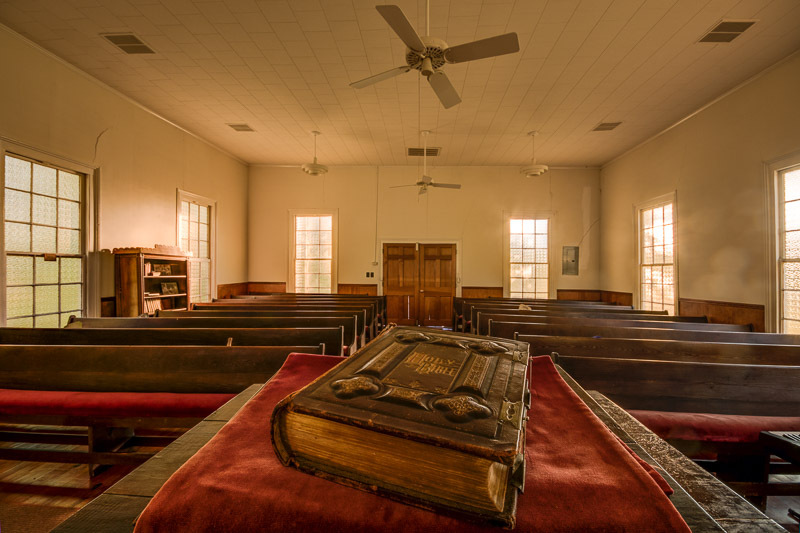 Rockwell Universalist is a treasured local landmark in Barrow County. It has been an integral part of the life and history of the area for over 175 years and is on the National Register. The ultimate measure of its importance and longevity is that Rockwell, the second oldest Universalist congregation in Georgia, remains active today with services held on the first Sunday of each month. Maintaining a historic treasure like Rockwell is a challenge but the little congregation is doing their best to rise to it. We are grateful. Hi – My name is Holt Etheridge, treasurer of Rockwell Universalist Church in Winder, GA.